Organic yarn is perfect if you are concerned about sustainability. Here at Hobbii, we have a sense of environmental responsibility and we are proud to offer you a wide range of different organic yarns, enabling you to knit or crochet with a clear conscience. All our organic yarn is manufactured with 100% organic ingredients and sustainable dyes only, in compliance with the GOTS (Global Organic Textile Standards), solely supplied from certified dealers. When you purchase organic yarn from our shop, you can rest assured that the quality is excellent. 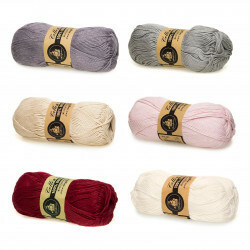 Shopping for organic yarn in our shop, offers you the choice between 100 % organic cotton and 100 % organic wool. Besides from which you can also find cotton and wool blends. Naturally, there are many other advantages related to buying organic yarn - not only do you care for the environment, organic yarn is also extremely soft on the skin. If you suffer from sensitive skin, you can benefit from using organic yarn, which will feel amazing and will not scratch, itch or in any way trouble you. Organic yarn can be used for knitting or crocheting almost anything. Be it jumpers, hats, mittens, or scarves, stuffed teddies or baby rattles, safe enough for your baby to chew on without risking getting chemicals in his or her mouth. Furthermore, organic yarn is incredibly easy to work with even for beginners. 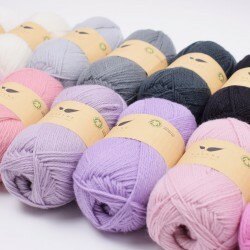 Knitting or crocheting alike, you can benefit from using organic yarn, that is guaranteed to give you a smooth start to your crocheting or knitting career - not to mention a glorious end resultat. At Hobbii, we realise that you face many decisions every day. So we aim to make it easy for you to knit or crochet in your spare time, without having to worry about chemicals or poor quality. 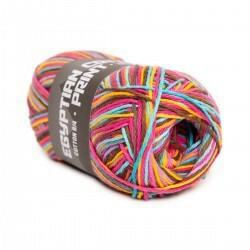 When you choose to shop for yarn in our shop, we have ensured that everything is topnotch. 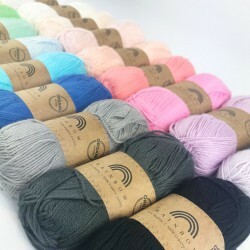 Here at Hobbii.com we want to be among the best and fastest in terms of delivery of organic yarn and yarn accessories. Which is why you will always receive your order within three working days of placing your order online. We take pride in our high level of customer services, and you are always welcome to give us a call, if you have any questions about any of our products. You always have the right to return any order placed at our webshop. Please do not hesitate to contact us, if you have questions regarding our organic yarn or if you need help placing an order. You can reach us by filling out the contact form, and we will get back to you as soon as possible. You call also call us at tel.no. +45 31 86 33 57 or email us at support@hobbii.com. We look forward to welcoming you as a customer in our shop. So pleased to receive parcel containing Nature Organic Wool, have started knitting a baby cardigan in colour 02, knitting up beautifully, so lovely and soft, ideal for baby garments. Parcel arrived promptly, I will be ordering more wool from Hobbii. I usually don’t like the feel of cotton when I crochet, but this organic cotton is amazing! It is soft and the colors are just as pictured. This is the first time I’ve ordered from you, but it won’t be the last. Thank you. Always so exciting to get happy mail from Hobbii! This yarn is extremely soft and the colors are gorgeous. The only budget friendly organic yarn I could find in so many colors! And it does not disappoint. 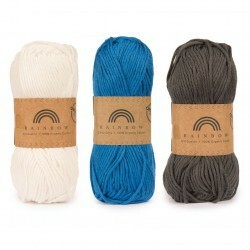 Rainbow Organic 8/8 cotton yarn is exactly what we hoped it would be -- soft and good-looking. We wanted an earth and human friendly cotton yarn and hoped the many skeins in the 7 colors we ordered would be as consistent and lovely as non-organic options. When the package arrived, we were super pleased. Giddy, in fact. 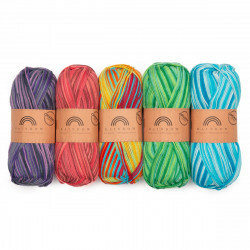 Organic 8/8 is now the go-to yarn for our knitted goods. One note regarding shipping: if you're in the western U.S., allow for the maximum delivery time. We like this product and hobbii as a company, so it's worth the wait. I ordered this for myself and liked it so much I ordered more to give as a gift. I'm so pleased to have an organic yarn. The skeins are small but large enough for the amigurumi projects I have planned. I'm located in the US. Shipping was prompt and affordable. Highly recommend. A friend wanted a pair of organic cotton gloves due to sensitivity to wool and I ordered the grey and light blue. They are LOVELY! They knit up beautifully, excellent tension and super warm. I will be ordering again. Not crunchy like so many cottons! I wanted an organic cotton to knit for my new grandson who lives in the South. The quality is superb and the shipping was spot on. I can’t wait to start this sweater for our baby boy coming in June. Love this yarn. Nice to work with and beautiful colors. It's soft and perfect for my projects. I also love the fact that it is organic of course.